It might come as a surprise that while you’re asleep or at rest your neurons do not enjoy a similar period of tranquil inactivity, but instead remain hard at work. 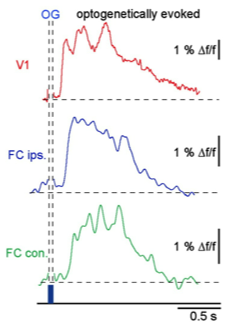 In fact, previous studies report that coordinated waves of slow oscillatory activity (< 1 Hz) spread through the cortex and thalamus during sleep, waking rest or under anesthesia. But until now, the mechanisms by which neurons synchronously communicate over such vast distances have been somewhat of a mystery. In their study recently published in Neuron, researchers from Arthur Konnerth’s lab at Technical University Munich probed the origins and trajectory of these slow waves. 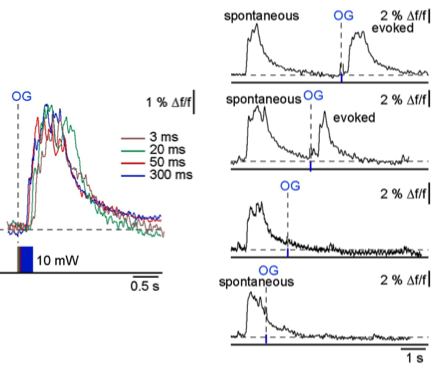 Using an innovative approach that integrates optogenetic stimulation with fluorescent calcium recordings in living mice, Konnerth and colleagues discovered several novel properties of slow oscillatory activity. They first virally transduced cortical layer 5 neurons to express channelrhodopsin (ChR2), a light-gated ion channel that selectively activates the genetically-targeted neurons upon light stimulation. They then used two-fiber recordings to optically stimulate the ChR2-expressing cells and simultaneously record calcium signals associated with slow waves. Konnerth’s group demonstrated that spontaneous, as well as visually- and optogenetically-evoked, calcium waves share similar response properties, and showed for the first time that these slow waves behave in an all-or-none manner. Above a minimum threshold of stimulus duration and intensity, slow waves exhibit constant amplitude and duration (Figure 1, left), suggesting that a similar number of neurons typically contribute to the generation of a slow wave. They further revealed that slow oscillations, much like their little brother the action potential, have reliable absolute (< 1.5 sec) and relative (1.5-3 sec) refractory periods (Figure 1, right). But how do these remarkably uniform slow oscillations spread throughout the brain? Notably, the researchers observed calcium waves that propagate throughout the entire cortex and even across hemispheres. While spontaneous waves preferentially traveled from frontal to visual cortex, visually or optically stimulating the visual cortex produced slow oscillatory activity that originated in visual cortex and propagated (at a rate of 22 mm / sec) to bilateral frontal cortex (Figure 2). Thus, locally generated slow waves can rapidly recruit even remote brain regions. Finally, they probed the spatiotemporal dynamics of slow waves that engage both cortical and thalamic networks. 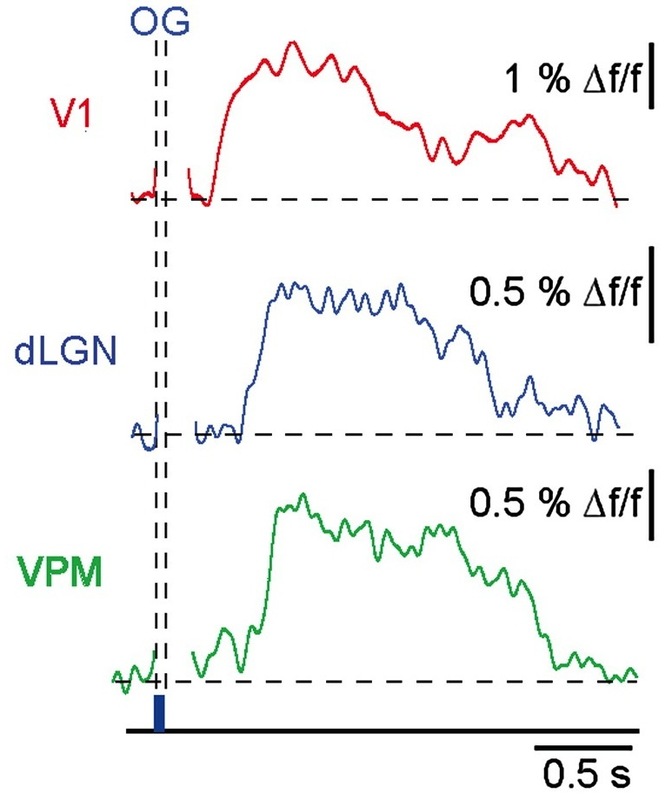 Stimulating the lateral geniculate nucleus of the thalamus generated slow oscillations that originated not at the thalamic stimulation site, but in the visual cortex, and proceeded to spread back to the thalamus (Figure 3). Since they did not observe an early thalamic slow wave, this suggests that although the initial thalamic activation is insufficient to produce a local slow wave, it’s adequate to recruit a larger population of cortical neurons that ultimately induces widespread corticothalamic slow oscillations. Want to learn more about the origins of corticothalamic slow waves? Don’t miss Dr. Arthur Konnerth’s seminar, Tuesday April 9, 2013 at 4pm in the CNCB large conference room. Your slow wave activity is sure to be at an all-time low during this stimulating talk! Emilie Reas is a fourth year UCSD Neurosciences PhD student working with Dr. James Brewer. She has an unhealthy obsession with the hippocampus and uses fMRI to study human memory.